Shelling intensified in eastern Ukraine overnight on Wednesday, with Kiev and rebels trading blame for opening fire. Local officials said 19 people, both civilians and militiamen, were killed and over a hundred injured in the bombardment. 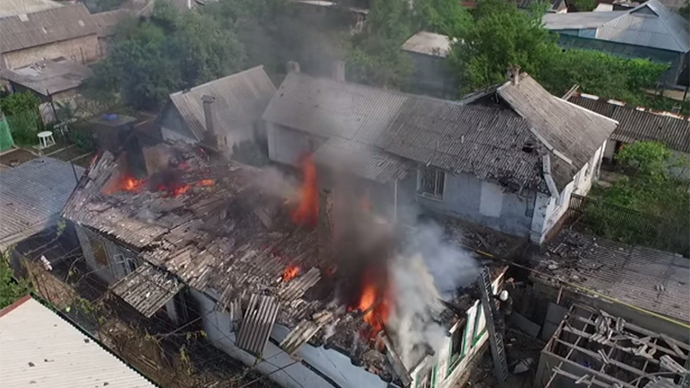 “With the onset of daylight the Ukrainian artillery carried out a large-scale shelling of settlements in the Donetsk People’s Republic almost on the entire extension of the contact line. The most violent unsighted bombardment by the Ukrainian artillery targeted Donetsk, Shirokino, Gorlovka and Spartak,” Eduard Basurin, spokesman for the Donetsk People’s Republic’s (DNR) Defense Ministry, told the press. The shelling saw 5 civilians killed and 24 others wounded, nine of them seriously injuries, he said. As for the losses incurred by the DNR militia, “the number of the deceased is 14 people; 86 are injured, including 18 – seriously,” Basurin is cited as saying by Tass. Earlier, Donetsk mayor, Igor Martynov, said that six civilians had been killed in the city’s south-western Kirov and Kuibyshev Districts on Wednesday, while 90 people “both militiamen and peaceful civilians” sustained injuries. Chief Doctor at the Petrovsky District Hospital, Igor Rutchenko, said that the Ukrainian forces persisted in shelling the hospital even as the injured were being brought there, forcing a patient evacuation. “The hospital has been without energy for over two hours. The shelling of the area goes on. It was decided to evacuate the victims,” the chief doctor told Donetsk News Agency at around 3:00 pm GMT. The Donetsk mayor’s office said that patient evacuations have also begun at other hospitals in the shelled Petrovsky district, Intefax reported. The General Staff of Ukraine said that Kiev’s forces were using heavy artillery that had previously been withdrawn from the frontline under February’s Minsk peace deal. “In order to stop the enemy’s offensive and to avoid casualties among the troops, the Ukrainian military command – after warning all of its international partners – was forced to use artillery, which was in the rear areas defined by the Minsk agreements,” the General Staff’s press-service said as cited by RIA-Novosti news agency. Moscow is deeply concerned by the deteriorating situation in the Donetsk Region, largely provoked by the armed forces of Ukraine, Dmitry Peskov, the Russian President’s press-secretary, said. “Naturally, Moscow is closely watching (the situation) and is deeply concern by the provocative actions of the armed forces of Ukraine, which, as far as we can tell, largely instigate the situation,” Peskov is cited as saying by Tass. Moscow “expects the unconditional implementation of the Minsk agreements” and will form its position depending on the developments on the ground, he added. The OSCE Special Monitoring Mission to Ukraine (SMM) is closely watching the situation in Donetsk, Michael Bociurkiw, SMM spokesperson, said. Russia’s foreign minister, Sergey Lavrov, reported that Moscow had addressed the Organization for Security and Cooperation in Europe (OSCE), asking for a report on the number of killed and injured in the latest escalation of the conflict in eastern Ukraine. “Judging by the information we’re getting from the frontline, self-defense militia are reporting disastrous damage to civilian infrastructure – hospitals, kindergartens, schools and residential buildings. And its civilians who are dying there. The Ukrainian army reports its losses are mainly on the military side,” Lavrov said. 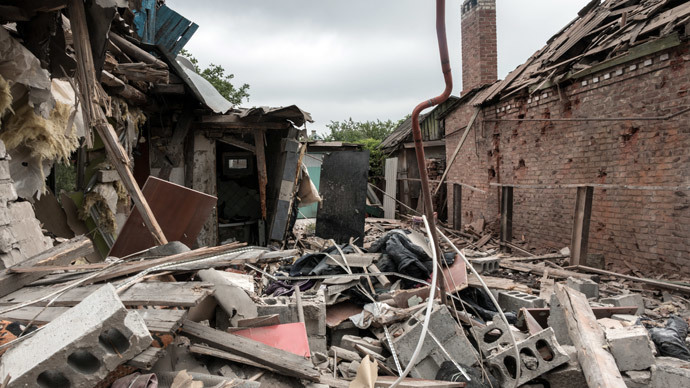 Overnight Kiev’s armed forces shelled rebel positions “across the entire frontline,” according to the self-proclaimed Donetsk People’s Republic’s defense minister, Vladimir Kononov. He reported 15 dead, both fighters and civilians. “They opened fire on our positions across the entire front line: at Shirokino, Elenovka, Maryinka with 120,122 and 125-mm rounds. We have been engaging them for seven hours now,” he added, as cited by the Donetsk news agency. The DNR blames Kiev for “provoking” its troops at around 3:45 this morning. Kiev denies any provocations and blames the rebels. Kiev’s ‘Anti-Terror Operation’ spokesman, Andrey Lysenko, believes a rebel offensive is underway in Donbass. “At three in the morning, the enemy started firing on our positions near Maryinka and Krasnogorovka, using heavy artillery. They are trying to make advances, but our forces have repelled every attack and are keeping the situation under control,” he said as cited by RIA Novosti. Three mines in Donbass lost power following artillery shelling, trapping almost 1,000 miners underground, according to Basurin. “The Abakumov and Skochinsky mines lost power, trapping 379 people,” he said, according to Interfax. Later he reported that the Zasyadko mine in Donetsk’s Kiev region had also lost power, trapping a further 576 miners underground. All of the trapped miners at the Zasyadko mine had been evacuated to the surface by mid-day on Wednesday after “electric power supply was restored,” the DNR Emergencies Ministry said. 40 miners were also rescued at the Skochinsky mine, the ministry added. 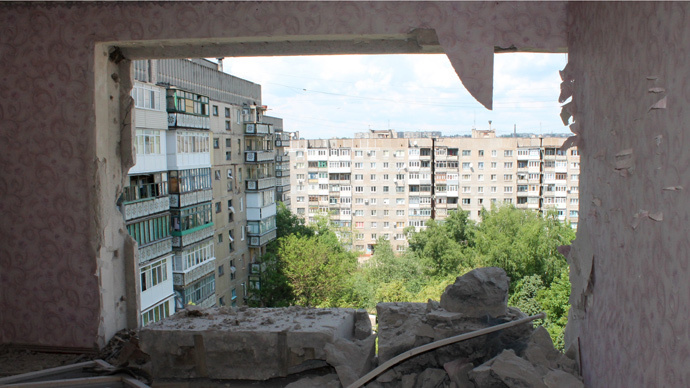 Donetsk mayor Martynov says over 3,500 buildings have been damaged since Kiev’s military operation began in Donbass, over 350 of them being completely destroyed.